This morning I had the pleasure of experiencing brunch at Soane's Kitchen, the new-ish restaurant, cafe, cocktail spot located in our beloved Walpole Park. Despite quite a few dinners there, this was my first brunch and it was rather excellent! As someone in their 8th month of pregnancy, I naturally avoided the bottomless Prosecco option (additional £20 for 2 hours) but compensated by having extra bacon (it's allowed!). The shakshuka was really good, very fresh with lots of seasoning and perfect poached eggs - I also had a flat white, pineapple juice (much to the terror of my companion who was convinced I'd go into labour immediately) and sourdough toast. Additionally, we picked up a few cakes - initially intended for later on this afternoon, that actually got eaten with tea as soon as we returned from our walk around the park. Limeyard Ealing, new menu & competition! Today you're in for a treat, Limeyard Ealing have a new menu - launching today - for me to tell you about AND I have my first ever blog competition for you to go and try it for yourself! 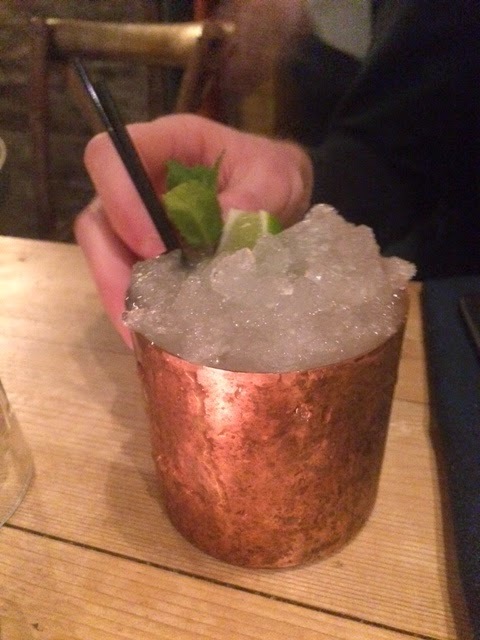 First and foremost though, I must tell you about the night I had at Limeyard last week. Along with some of the great and good of Ealing (note to reader - I do not consider myself to be either of those things!) I was invited along to try the new menu that Limeyard are launching today. Having been to Limeyard a few times (more about that here) I was pretty excited as I love the people there (special shout out to geordie waitress Sam who is pretty awesome!) and the food is always good, plus I was told we'd be trying the majority of the new menu...........including new cocktails. Unsurprisingly this sealed the deal and it was a date.